Multiplexed states encode multiple states of a cellular automaton's evolution as one state. This encoding is demonstrated with reversible second-order totalistic automata. The initial condition for such an automaton multiplexes two binary initial conditions into a four-color state. The upper plots show the initial multiplex between its past and future components. 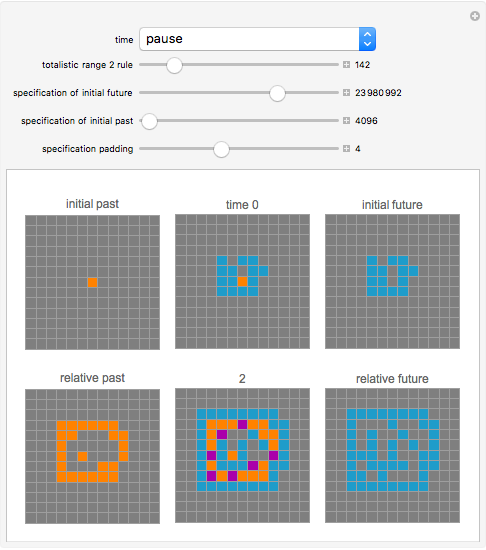 The lower plots show the step of the evolution between its relative past and future. Michael Schreiber "Reversible Multiplex of Totalistic Cellular Automata"